Norbert Meier will have enjoyed watching his Arminia Bielefeld side defeat Borussia Mönchengladbach. Norbert Meier watched his journeymen Arminia Bielefeld side complete a hat-trick of German Cup scalps by seeing off Borussia Mönchengladbach. seeing off Mönchengladbach on penalties at the quarter-final stage. In each of Arminia’s three giantkillings this term (Hertha Berlin, Werder Bremen and Gladbach), a potent mix of doggedness, sound organisation and tactical flexibility has bridged the chasm in class and though few will expect another upset when in-form Wolfsburg visit them in the semi-final on April 29, the canny Meier is sure to have a few tricks up his sleeve. Meier represents the best of both football worlds. The know-how from a top playing career (18 caps in midfield for West Germany and a Bundesliga title with Bremen in 1987-88) plus many, many years of lower league coaching experience, most of it spent reviving big-name clubs with problems (MSV Duisburg, Dynamo Dresden, Fortuna Düsseldorf and Bielefeld). Due to be played on April 28, the other semi is a ‘Die Klassiker’ remake, with triple-chasing Bayern Munich hosting arch-rivals Dortmund. Slipping to rock bottom of the league after losing 2-0 at home to Wolfsburg on Saturday, Hamburg truly are a demoralised, dyfsfunctional outfit at the moment and no one would have been especially surprised to hear that their Swiss internationals, Johan Djourou and Valon Behrami had come to blows at half-time, the latter reacting badly to the former’s criticism and a punch-up ensuing. Both players now face heavy fines, but at least they don’t find themselves in the shoes of Leverkusen’s Bosnian defender, Emir Spahic, who this weekend was sacked for brawling with jBayArena security staff after the Rhinelanders’ penalty shoot-out defeat to Bayern in the German Cup. Currently out injured, Spahic apparently blew a fuse when friends of his were refused entry to the dressing room area and with damning images of the ruckus emerging on social media, the centre-back was history. so-called battle of the Borussias quickly turning into a one-sided romp. The Dortmunder really do need to be awake at kick-off. The goal they let in after just 28 seconds versus Gladbach – Oscar Wendt doing the honours – was the third time this season they have conceded in the first 60 seconds. Tayfun Korkut appears to be living on borrowed time as coach of Hannover, but he retains the support of the club chairman. 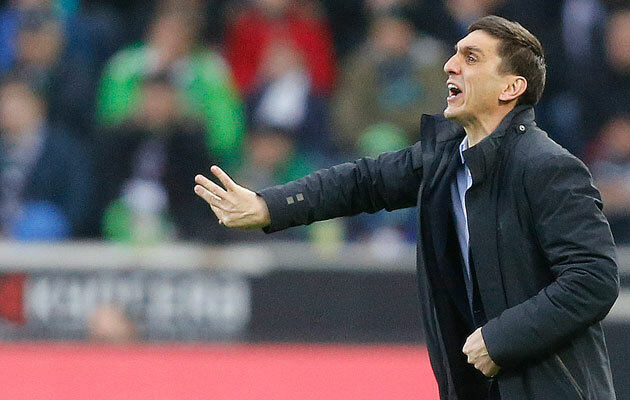 It’s fair to say that many Hannover fans are perplexed by the marked reluctance of club president Martin Kind to look at the disastrous results of the past few months – the 1-1 home draw with Hertha Berlin on Friday was the Reds’ 12th game without a win – and put hapless first team boss Tayfun Korkut out of his misery. For most of his 18 years as chairman of the board, Kind has been notoriously trigger-happy when hiring and firing coaches. But for reasons best known to himself, the patriarch suddenly seems to have discovered the non-agressive teachings of Gandhi, reacting to classification free-fall and impending relegation with a job guarantee for Tayfun. One-hundred-and-nineteen-years-old this weekend, Hannover run the risk of turning 120 in the second tier. Eintracht Frankfurt’s hopes of qualifying for next season’s Europa League received a potentially fatal blow with the medical missive that top scorer Alex Meier must have an immediate operation on tendons in his right-knee and will have to sit out the rest of the campaign. Currently the top scorer in the Bundesliga with 19 goals, Meier would have fancied his chances of ending the season as the country’s leading marksman, but now looks likely to be overhauled by the likes of Bayern’s Robert Lewandowski or Bas Dost of Wolfsburg.